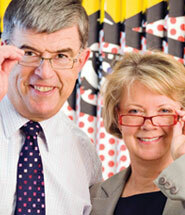 Specsavers was founded in 1984 by Doug and Mary Perkins, who started the business in their spare bedroom on a table-tennis table. They had moved to Guernsey after selling a small chain of West Country opticians. In the early 1980s the UK Government deregulated professionals, including opticians, allowing them to advertise their products and services for the first time. Doug and Mary seized the opportunity and opened their first Specsavers, value-for-money, quality eyecare opticians in Guernsey and Bristol, followed shortly by stores in Plymouth, Swansea and Bath. They aimed to offer a wide range of stylish, fashionable glasses at prices affordable for everyone. They wanted the company to be as trustworthy as a local independent but with the huge buying power of a national company so that savings could be passed on to the customer. The company has grown rapidly since, thriving with its joint venture partnership approach to eyecare. It hit the milestone of 100 stores in July 1988, 200 in 1993, 300 in 1995, 400 in 2000, 500 in 2003, 600 in 2004 and 700 in 2005. The first Irish store opened in 1990, the first Netherlands store opened in 1997, the first Swedish in 2004, and 2005 saw the first in Denmark and Norway. In 2006 the first store was opened in Spain and in 2007 the company began supplying in Australia and opened the first store in Finland. 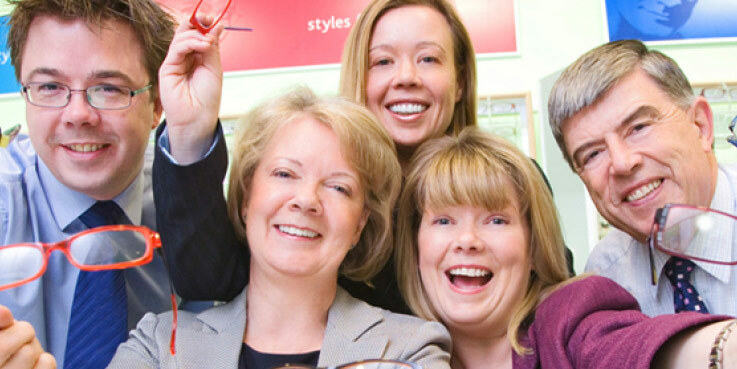 In January 2008 Dame Mary Perkins opened the 1000th store in Roosendaal, Holland followed by the launch on the first three Specsavers stores in Australia in March. By December there were 153 in Australia plus 10 in New Zealand. Specsavers range includes Tommy Hilfiger,Karn Millen, Timberland, Karl Lagerfeld. Our frames are developed using the latest innovative manufacturing and design techniques from the highest quality components and raw materials available. The full range of over 2,000 size and colour options is structured around a comprehensive features and benefits pricing structure starting from 29 € through to 210 €. Our own lens manufacturing laboratories - three of the largest in Europe, supply the latest high-tech lenses in volume at the lowest possible cost. All Specsavers frames come with free Single Vision lenses as standard. Specsavers is also the retail market leader in contact lenses, with it's own brand of easyvision monthly and daily disposable lenses and has also driven the use of continuous-wear lenses. The company continues to expand. From just two staff working at that table-tennis table, there are now more than 500 based at Specsavers' headquarters in Guernsey and around 17,000 worldwide. The company has more than 1500 stores across the Channel Islands, UK, Ireland, the Netherlands, Scandinavia, Spain, Australia and New Zealand.